In the years following the First World War the price of fur was high and when many areas down south were trapped out southern trappers headed to the Northwest Territories. In 1920 a young trapper named August (Gus) D’Aoust came north from his home in Manitoba to try his luck at trapping around Fort Smith (map). He was reasonably successful and convinced his brothers Phil and Hughie to join him in the north. After 46 years as a barren land trapper 70 year old Gus D’Aoust retired to Fort Reliance where for a number of years operated a small trading post. 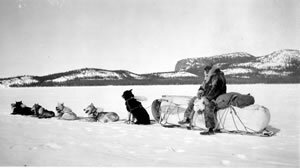 Gus D'Aoust sitting on loaded sleigh with dog team, 1940s.